Two analyses of the genetic alterations that characterize paediatric cancers reveal key differences from adult cancers, and point to ways of optimizing therapeutic approaches to combating cancer in children. Pratiti Bandopadhayay is in the Department of Pediatric Oncology, Dana-Farber Cancer Institute, Boston, Massachusetts 02215, USA, and at the Broad Institute of Harvard, Massachusetts Institute of Technology and Harvard Medical School, Boston. Matthew Meyerson is in the Department of Medical Oncology, Dana-Farber Cancer Institute, Boston, Massachusetts 02215, USA, and at the Broad Institute of Harvard, Massachusetts Institute of Technology and Harvard Medical School, Boston. The mapping of the human genome, followed by the explosion in next-generation genome sequencing, has revolutionized our understanding of cancer. These advances have paved the way for precision-medicine approaches to treating adult cancers. Two papers in Nature report the first pan-cancer genomic analyses in children. In the first, Gröbner et al.1 analysed sequences of whole exomes (all the protein-coding regions in the genome) or whole genomes for 961 cancers across 24 tumour types, with an emphasis on tumours of the central nervous system. In the second, Ma et al.2 used similar analyses to characterize 1,699 cancers across 6 types of cancer tissue, particularly leukaemias. The findings provide valuable insights into the mechanisms that shape the genomes of childhood cancers. Adult cancers frequently involve multiple genetic alterations that together drive cancer progression, including small mutations of one or a few DNA bases, and larger changes called structural variants that span more than 1,000 bases. Such drivers can be shared across cancer types3. One of the most meaningful outcomes of the current studies is their confirmation that the genomic landscape of childhood cancers differs from this picture. Previous studies of individual paediatric cancer types4–7 have revealed that they have fewer mutations and structural variants, on average, than do adult cancers3,8, but the current pan-cancer analyses take this further, systematically highlighting several key differences between childhood and adult cancer genomes (see ‘The differing genomic landscapes of childhood and adult cancers’). Two studies1,2 have analysed genome sequences from a range of childhood cancers, and uncovered key differences from adult cancers. First, there are fewer mutations and structural variants in paediatric cancers than in adult cancers. For instance, Gröbner et al. report a mutation rate 14 times lower for childhood than for adult cancers. Furthermore, both groups find that the total number of mutations in paediatric-cancer genomes correlates significantly with age — consistent with the idea that cells accumulate mutations with age. Second, paediatric cancers are frequently defined by a single driver gene. For instance, 57% of the cancers in Gröbner and colleagues’ analysis harboured single driver mutations. These authors also highlight the fact that germline mutations, which are inherited from parents and are present in all cells of the body, are a causative factor in childhood cancers — 7.6% of cancers in the authors’ cohort are associated with detectable germline mutations. Furthermore, paediatric cancers tend to be enriched in either mutations or structural variants, rather than a mixture of the two. Indeed, the group observes enrichment of germline mutations involved in a DNA-repair pathway called mismatch repair in cancers defined by mutations, and germline mutations in a tumour-suppressor gene, TP53, in cancers characterized by structural variants. These differences highlight potential mechanisms by which different paediatric cancer genomes are shaped. Third, different genes are mutated in paediatric compared with adult cancers. 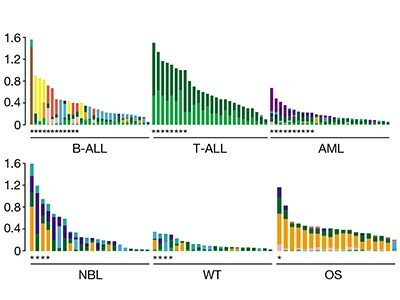 Only 30% of significantly mutated genes identified by Gröbner and co-workers (those that have acquired more mutations than would have been expected to occur by chance, and so are likely to be involved in cancer progression), and only 45% of those reported by Ma and colleagues, overlap with adult pan-cancer analyses. These differences are borne out in the groups’ mutation-signature analyses, which provide information about the mutational processes that lead to a particular pattern of mutations. Fourth, and perhaps most intriguingly, driver mutations tend to be specific to individual paediatric cancer types, with minimal overlap across diseases. This is in contrast to adult cancers, which more frequently share mutations across types, according to Gröbner and colleagues’ analysis. This finding by the current studies might reflect the differing paths to cancer development between adult and paediatric cancers. Adult cancers often arise through a multiple-hit process in which alterations in genes generally beneficial to cell survival accumulate as cells become cancerous9. By contrast, a model of paediatric cancers posits that, in some cases, a single, specific driver alteration might promote cancer development in certain cell lineages, if it results in aberrant gene expression during a crucial period of development6. Indeed, a study in mice has also highlighted the importance of developmental context and the timing of genomic perturbation in tumour development10. The insights gleaned from the current analyses have implications for precision-medicine approaches for childhood cancers. Gröbner et al. found that about 50% of the tumours that they profiled harbour genomic alterations that can be targeted (directly or indirectly) by drugs that are available or under development. This number, which is consistent with previous reports11,12, is a cause for optimism. The findings also provide insights into how clinical assays could be designed to ensure robust detection of alterations specific to paediatric tumours. Assays must profile genes that are significantly mutated across childhood cancers, with sufficient sensitivity to detect single driver alterations in an individual’s genome, and must be specifically designed to include mutations and structural variants in both coding and non-coding regions of the genome. Furthermore, the studies reinforce the need for paediatric oncologists to consider the high incidence of germline mutations in their patients. Clinicians should offer genetic counselling (in which patients are advised about risks and management options for genetic disorders), testing for germline alterations and appropriate screening for families who are found to harbour germline mutations. Although the current studies provide valuable insights, much work is still required to complete the picture. 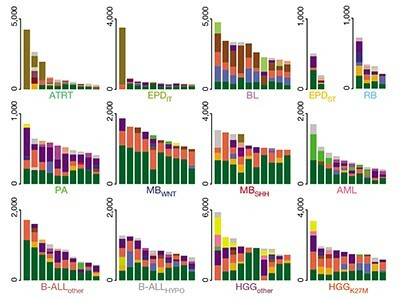 Gröbner and colleagues were unable to identify driver alterations in 10% of tumours, and neither group analysed enough samples in a specific cancer type to detect infrequent mutations. Childhood cancers are, by definition, rare tumours. Continued collaboration and data-sharing are required to amass information from enough tumours of each type to comprehensively identify recurrent driver alterations. Furthermore, given that both groups identified structural variants, which often occur in non-coding regions, whole-genome sequencing is needed to detect drivers outside coding regions. Data from both studies are available for review — Gröbner and colleagues’ at go.nature.com/2bq3oyh, and Ma and colleagues’ at go.nature.com/2svr9hh. This is a key step in paving the way for further analytical efforts across large cohorts of paediatric tumours. Last but not least, it will be necessary to elucidate the mechanisms by which the identified genetic alterations drive childhood cancer. This will improve our ability to target these alterations therapeutically. Gröbner, S. N. et al. Nature 555, 321–327 (2018). Ma, X. et al. Nature 555, 371–376 (2018). Lawrence, M. S. et al. Nature 505, 495–501 (2014). Zhang, J. et al. Nature Genet. 45, 602–612 (2013). Bandopadhayay, P. et al. Nature Genet. 48, 273–282 (2016). Lee, R. S. et al. J. Clin. Invest. 122, 2983–2988 (2012). Crompton, B. D. et al. Cancer Discov. 4, 1326–1341 (2014). Beroukhim, R. et al. Nature 463, 899–905 (2010). Greaves, M. & Maley, C. C. Nature 481, 306–313 (2012). Han, Z.-Y. et al. Nature Commun. 7, 10421 (2016). Ramkissoon, S. H. et al. Neuro-Oncology 19, 986–996 (2017). Worst, B. C. et al. Eur. J. Cancer 65, 91–101 (2016).